Former Chelsea and Liverpool attacking midfielder Joe Cole has picked Nigeria legend Vincent Enyeama in his dream five-a-side team. Cole announced his retirement from football on Tuesday at the age of 37, thereby drawing the curtain on a glittering 20-year professional career. 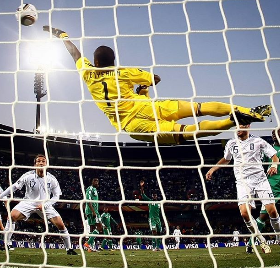 A product of the West Ham Academy, he played on the same Lille team as Enyeama during the 2011-2012 season and knows all about the shot-stopping qualities of the former Super Eagles goalkeeper. Explaining why Enyeama was named in his hypothetical five-a-side team, Joe Cole told talkSPORT : ''I could’ve gone with Petr Cech, David Seaman, Pepe Reina. John Terry (Chelsea), Eden Hazard (Lille), Arjen Robben (Chelsea) and Luis Suarez (Liverpool) were also named in Cole's five-a-side team made up of the top players he played alongside. Joe Cole and Enyeama shared the same pitch three times before the midfielder returned to Liverpool, against Inter Milan (Champions League), CS Sedan-Ardennes and Lyon (Coupe de la Ligue) during the 2011-12 season.